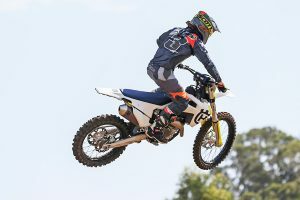 MotoOnline.com.au tests the 2019 Gas Gas EC 250 and EC 300. 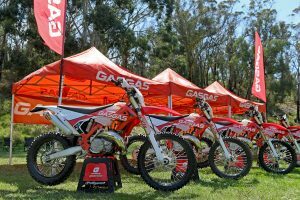 Gas Gas launched all-new EC 250 and EC 300 models last year, built brand new from the ground up in a brand rebuild with the backing of Torrot. With the launch of the new bikes, Gas Gas has gone from strength to strength and collected a whole host of achievements in the past 12 months, all of which have contributed to these revised 2019 editions. 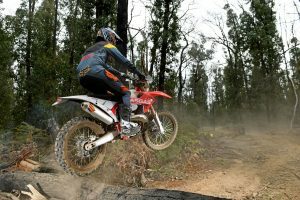 For the launch of the 2019 Gas Gas EC 250 and EC 300, MotoOnline.com.au was invited down to Victoria to sample the updated machines on some tight and rocky single trail on a private enduro loop that backed onto the Cobaw State Forest, delivering outstanding trail riding. 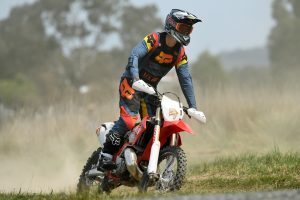 Gas Gas brand ambassador Shannon Noll was also on hand to give us his thoughts on the bike and a bit of an insight into the relationship between Gas Gas and the Australian entertainer. 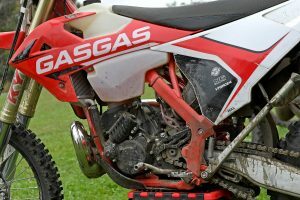 Gas Gas has refined the 2018 bike rather than start from scratch and re-invent the wheel on an already incredibly strong-performing motorcycle. A range of improvements and additions to the bike have produced a product that has improved upon the previous model. Refinements to the Gas Gas EC 250 and EC 300 include Neken handlebar and grips, redesigned handlebar mounts, redesigned cylinder-head, updated exhaust porting, 38mm Keihin carburettor, optimised electric start system and components, dual-map rain/sun ignition map switch, improved enduro computer mounting system, new graphic and updated air-box cover. The reasoning behind the refinements are generally for rider comfort and ride-ability over the previous version. 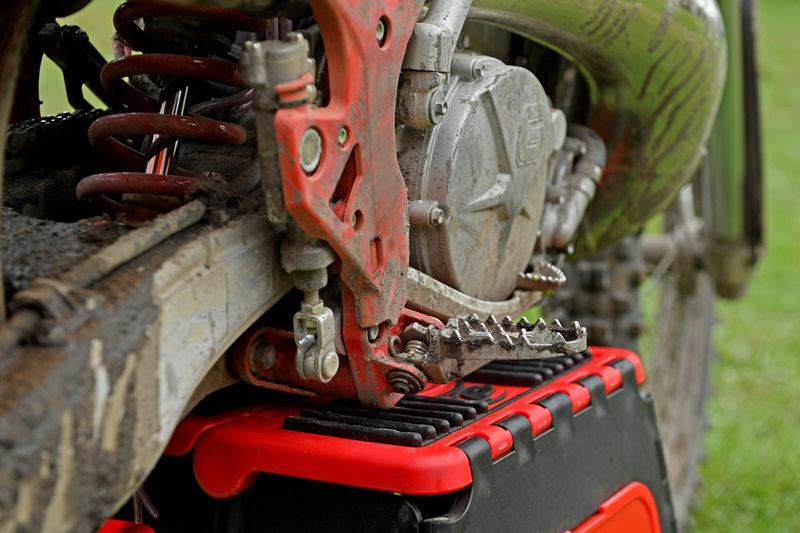 The new mapping switch mounted on the bars allows the rider to change the mapping depending on the trail conditions. The ‘Sun’ map is the standard mapping, is aggressive and gives you full use of the motor’s power and torque. 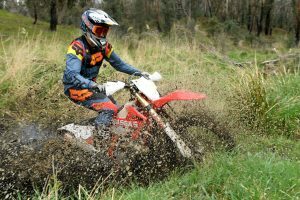 However, if the trail or track conditions are technical, muddy and tricky, the ‘Rain’ map gives a better mapping option to allow the rider more control of the power and more feel from the engine. 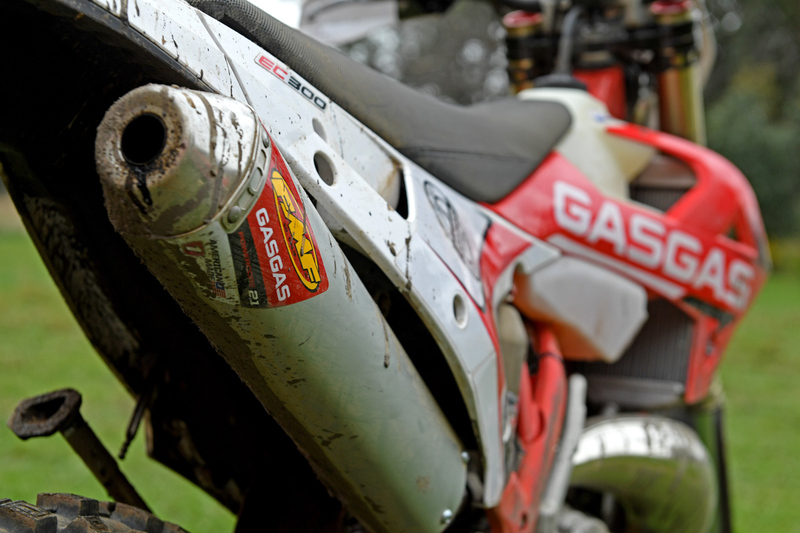 The electric start system has been updated with a much stronger battery for improved starting and reliability – Gas Gas still has the use of a traditional kick-start. Along with a new battery, the electrical installation has been updated, and the display mounting has also been revised to fit better with the upgraded handlebar and steering position. New side panels and a rear mudguard have also been added to the 2019 Gas Gas EC 250 and EC 300. The 2019 EC 250 and EC 300 both feel much like the previous model, which is outstanding. 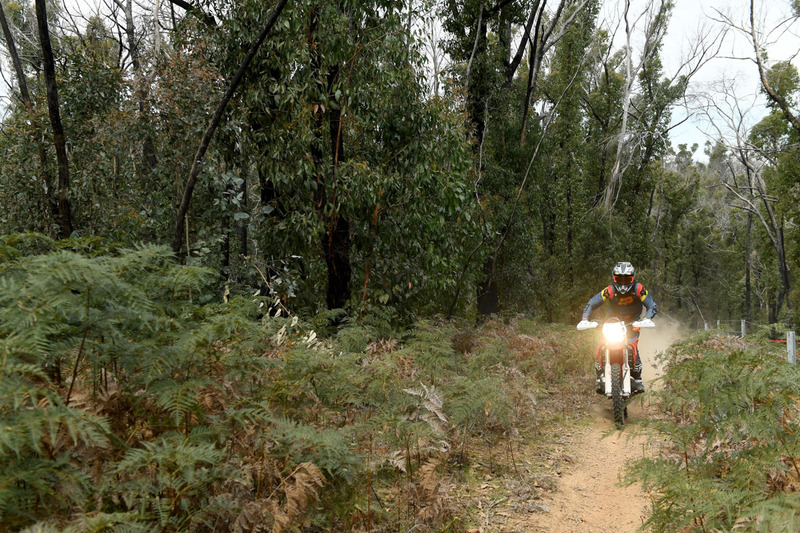 Both have extremely strong motors and are now much more easily adjusted to different riding conditions with the mapping switch, which we were able to make use of over the two days of riding. On the first day of riding we had dry conditions, however a heap of rain overnight made the trail slick in the morning and we were able to properly try out the different mapping switch settings and get a good idea on how much of an advantage using the Rain switch can be in tougher conditions. 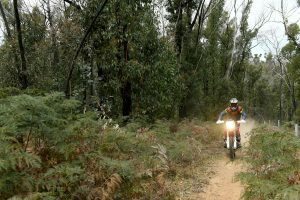 The torque of the EC 300 is broad, as the bike really likes to lug around the bush and has plenty of grunt up top as well. 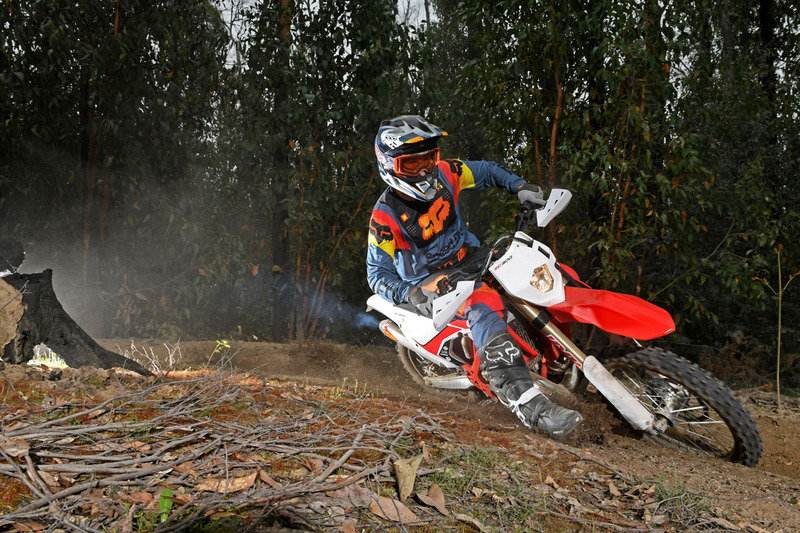 The big-bore two-stroke is a lot of fun in the tight single-track and magical when you open up the throttle on the faster, open trails. 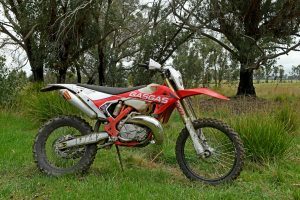 The EC 250 shares similar characteristics as the bigger brother as in it has a strong motor, but like you would expect it is a little easier to manage for the average rider and likes to be revved a little more. Simply put, it works better with a little more rider wrist input! Both of these Gas Gas models handle well and, like last year, the lightweight two-stroke is a great performer on the tight technical terrain thanks to the proven the KYB suspension package. KYB suspension is tried and trusted, so you really feel like the suspension is working well and is balanced in its operation. 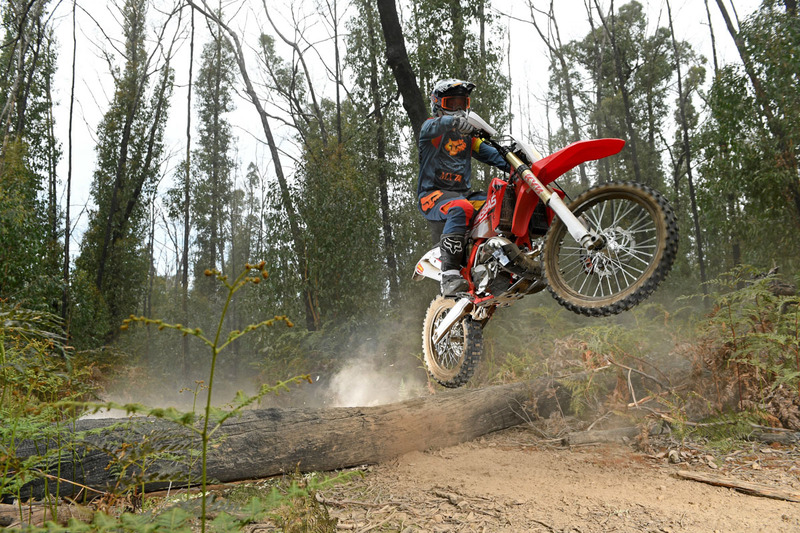 We didn’t have any really gnarly sections of track to negotiate, although there were several sections of the trail that lent itself to pushing your luck with how the suspension would react dropping off small ledges and harsh transitions, which the suspension and bike handled fine without blowing through all of the suspension or resulting in any deflection. 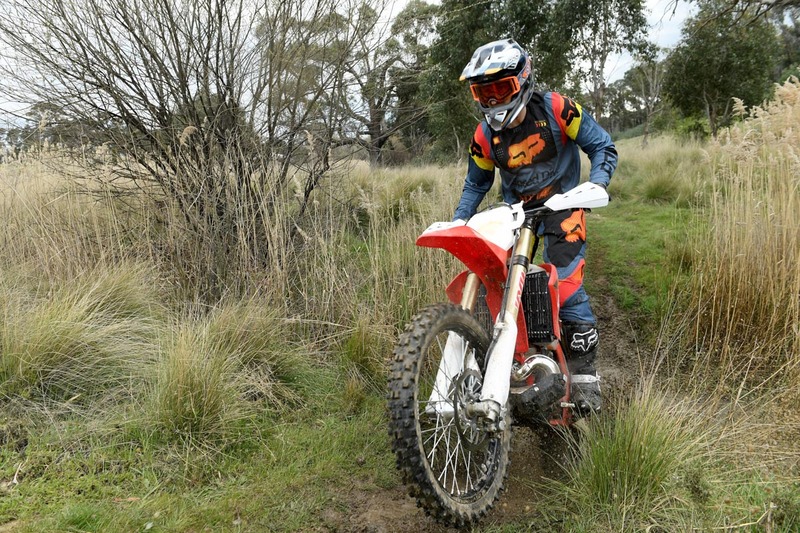 Through the tighter parts of the trail the suspension really works well with the geometry set-up of the bikes – it really turns well in the tighter switch-backs and off-camber turns. The front of the EC really feels like you can point it in the direction you wanted, without fighting it much at all. 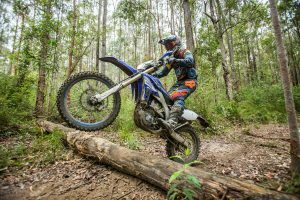 Needless to say, on the other parts of the trail the set-up felt very well-planted and that’s the type of ride the inspires confidence from the outset. 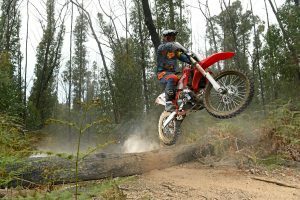 Overall, the character of the 2019 model Gas Gas EC 250 and EC 300 remains vastly the same as last year – which we’re stoked on – and the build standard of the bikes is excellent. 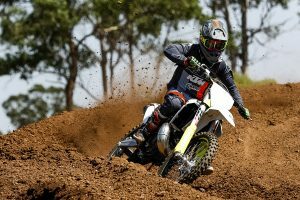 The very few refinements to the bike are a true testament that Gas Gas really hit the nail on the head initially with the 2018 models – the most notable additions being the mapping switch and new Michelin enduro tyres, which are yet to hit Australian shores. 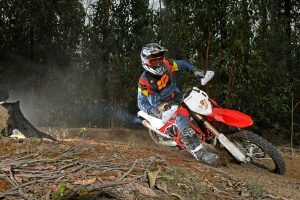 It’s hard to go wrong with a bike that boasts plenty of ponies – around 55hp for the EC 300 – that’s paired with a chromoly steel frame, KYB twin-chamber forks and KYB rear shock, Gas Gas/FMF PowerCore 2.1 exhaust and Magura hydraulic clutch. The pricing of the Gas Gas EC 250 and 300 are both really competitive, making them well worth a look if you’re in the market for a modern enduro machine. When you look at the quality components that the Gas Gas models come with, it’s hard to think past the brand when you’re considering a new two-stroke off-road motorcycle.